This Reflection 315RLTS travel trailer allows you to enjoy the comforts of home while away exploring the world with your favorite person. You can even invite over a few overnight guests. Just imagine sitting in the rear living area on the furniture provided while visiting with the cook preparing meals at the kitchen island or washing dishes in the large sink. You might even glance over at the 40" TV and fireplace ever once in a while. You will find storage everywhere you look including outside in the unobstructed pass-through compartment. 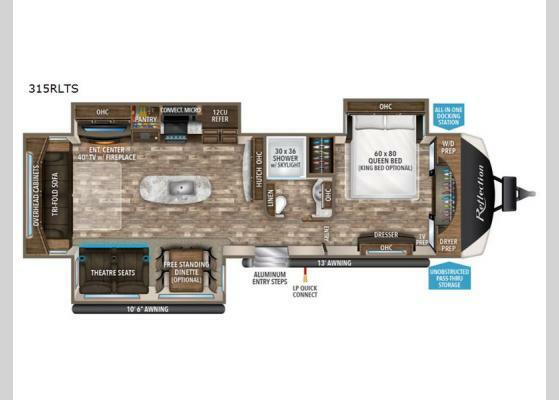 This model has many more standard features to enjoy and options to choose from to make this your perfect full-time or weekend retreat on wheels. What I liked most: The quality of construction, this is not a "built on a Friday before a long weekend" trailer. Prior to the Refection we have owned fifth wheels and park model trailers and without exception this is the best built RV we have had the pleasure of owning. 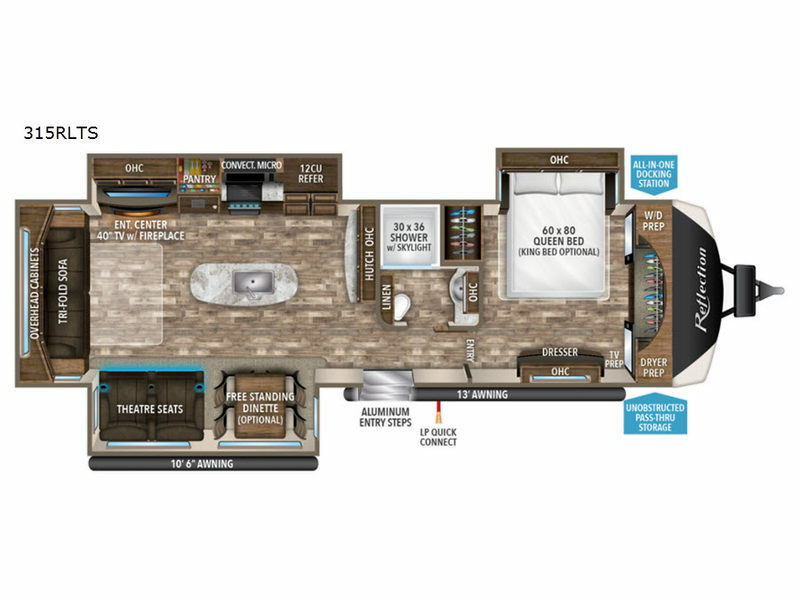 Everyone in our trailer park is amazed with the interior, especially the amount of storage space available. What I'd improve: The furnace/AC thermostat has got to go - nothing but problems. A power opening bathroom vent would be nice instead of the manual crank vent. I added a Yamaha sound bar with sub-woofer because the Furrion stereo leaves something to be desired. What I liked most: When we decided to look at new trailers last year we we set to purchase a third unit from the same manufacturer when we were introduced to the Grand Design Reflection line. At that time we had not heard of this manufacturer. Although we really liked the unit and the quality we saw I was skeptical and wanted to do some research before making the final decision. I spent quite a bit of time reading reviews and speaking with the Grand Design owners that we would see in parks while traveling. The end result was that we would switch brands and purchase our first Grand Design Reflection 315RLTS. After a few trips I noticed a structural issues and was put in touch with the Grand Design Warranty Department. This was their opportunity to show me what they claimed on their website about how they dealt with issues. What I experienced certainly substantiated their commitment to customer service. The warranty department staff were truly exceptional at taking care of everything. I would not hesitate to recommend this manufacturer and as a matter of fact friends have already purchased their own new unit after speaking to us. I am certain that when we are ready for another new trailer it will be a Grand Design product. What I'd improve: Can't think of anything.